Can't come to class? Subscribe now and I will send you a FREE yoga video to practice to at home. Simple, short yet effective! Follow the orange Yoga in English signs out on Grimmstr. to point you towards the right entrance. 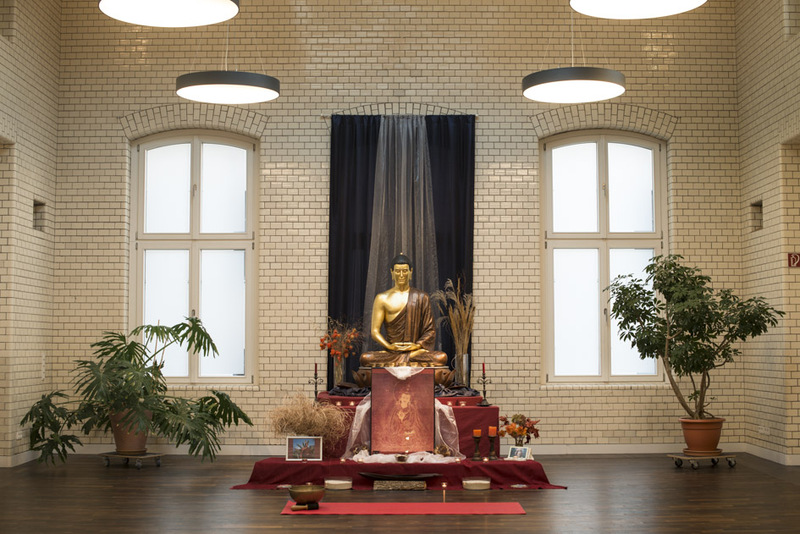 Buddhistisches Tor is an amazing space to practice in. You can feel it right away as you walk into the room - a sense of calm and peacefulness. My aim with both of these classes (the dynamic and yin alike) is to stay close to the very core of yoga - chitta vritti nirodha stating that yoga is the removal of the fluctuations of the mind (Patanjali Yoga Sutra 1.2). DYNAMIC FLOW YOGA - this is an uplifting and energizing Vinyasa Yoga session that connects movement with a flowing rhythm of your breath. The class is different every time with creative sequences - you will enjoy a wide variety of positions and breath-work, new techniques, philosophy insights and well-balanced sequences. Session culminates in a long, deep relaxation and calming meditation. YIN YOGA - the Yin class is designed to help and guide you to slow down, to drop in, to let go of what no longer serves you, to explore and feel into the holding patterns in your body, mind and breath, to restore and to renew. Sounds amazing? It is!! In time this practice cultivates patience, surrender, contentment and gratitude. In a Yin style practice the poses (asanas) are held for longer periods of time while relaxing the outer muscles of the body in order to reach the deeper tissues. In these passive holds the three ancient practices - Yoga, Traditional Chinese Medicine and Buddhist mindfulness techniques - are joined to give a holistic, wholesome and long-lasting framework for health, greater awareness and wellness. Yin Yoga is a powerful, transformative practice for body & mind: it recharges the body's energy flow and naturally draws the mind inward into a relaxed, meditative state. It helps us to slow down, explore and feel into holding patterns in the body, mind and breath, to bring rest and renewal. A calming soundtrack, a beautiful candlelit space and gentle guidance will support your journey. NB! The deeply relaxing nature of this practice will cool down your body, so be sure to wear warm clothes (and maybe bring socks). Mats and all other props are provided. Plus tea and a healthy snack after the class. No need to register, just show up on time! Please walk into the first courtyard, it's the second door on the right side, ring Türöffen and pull the door at the same time to enter. Sonne Studio is one of the two studios of a non-profit (community supported) organization called Yellow Yoga. It is an international, vibrant and authentic community of teachers and practitioners, who operate more like a community rather than a business organization. 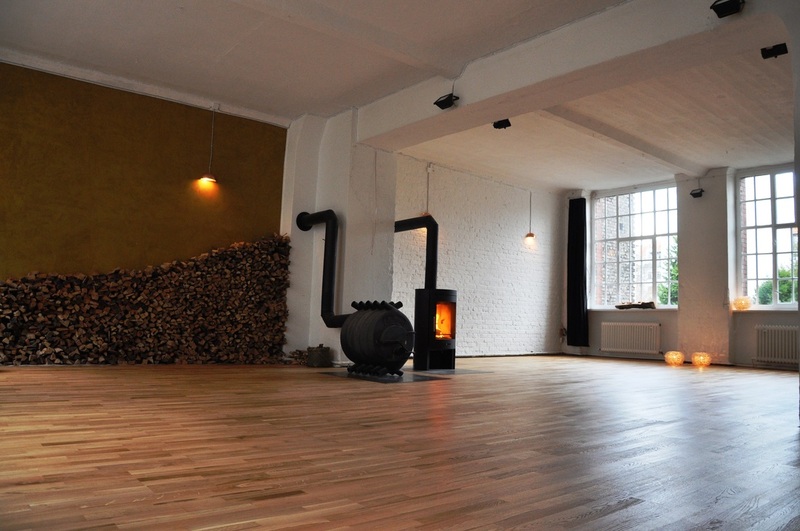 The studio itself is spacious, light and cosy with a fireplace to warm us on colder days and nights. Yellow Yoga wants to make yoga available for all - therefore you'll find lots of different teachers teaching types of yoga in their schedule at all times throughout the day, and more importantly - a sliding scale pricing system where yogis with higher monthly income (more than 1000€) offer to pay more (12€), so that yogis with lower income (less than 700€) can practice for a more affordable price (7€). The happy medium (9€) is where Yellow Yoga is able to cover their costs. The same system applies to monthly passes (80/70/60€) and 11-time cards (120/90/70€). SLOW FLOW is very suitable for beginners or people who like their yoga practice to be about winding down in a gentle, mindful and rejuvenating way. Using mindfulness techniques, you'll be guided to stay present in your body, moving and pausing in ways that allows you to release tension, yet stay energized and feel rejuvenated after the class. RESTORATIVE YOGA - is R&R (Relax & Renew) on the mat. It is a SACRED PAUSE. Minimum effort on your part with the maximum benefit for the body and mind. Using props and support, so that you can stay in poses for longer without any strain or effort, totally surrendering to gravity and letting everything drop. It's hitting a "pause" button to breathe more deeply, while the easy restorative yoga poses gently open the body in a unrushed and gentle manner, helping us learn to relax and rest deeply and completely. During this kind of deep relaxation, all the organ systems of the body are benefited, the mind slows down, the breathing finds it's natural rhythm. A perfect finish to a week and start to a weekend - unplug, restore, relax and recharge! If you have been to one of my classes and have ideas, suggestions, comments, criticism you wish to share, please DO! I appreciate your feedback and will most certainly use it to serve you better!